The past few weeks have been non-stop gloom around these parts. I wake up- it's foggy, I head to the gym- it's foggy, I head to work- it's foggy. Hopefully that explains a bit more about the current spring weather in San Francisco, and why on earth I am wearing a long wool camel coat in what is supposed to be "warmer weather." Generally, I would wear a more dressy shoe with this work look, but it was Friday, and dressing down just felt right. I wanted to keep the look office appropriate- the long coat, updo, and blouse-y top helped there. The casual denim high-tops and the distressed denim kept the look fun and unexpected. The original Off-Duty post, right this way. The striped shirt is amazing! I want this whole outfit! 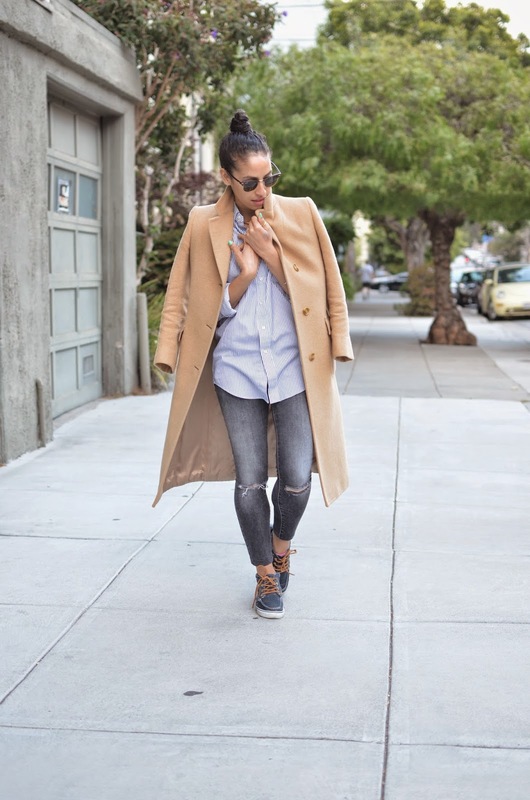 Love the trench, Carlina! This weather has been so off! You are totally right. So no April showers, does this mean no May flowers? Just clouds!? Loving that tan jacket though..work it girl! !